Choosing low-mercury fish and other seafood can significantly lower the body’s mercury levels in just three months, according to a new EWG study. The findings are good news for pregnant women and prospective mothers who enjoy tuna and sushi, which are primary sources of mercury in people’s bodies. By switching to lower-mercury seafood, they can help protect their future children against potential brain and developmental damage and they can do so while still getting enough of the omega-3 fatty acids that are essential for fetal and child brain development. In the study, 20 American women between 27 and 49 years of age with relatively high mercury levels followed the guidance in EWG’s Seafood Calculator to choose low-mercury seafood options. At the end of three months, the group’s average level of mercury, as measured in samples of participants’ hair, decreased by nearly a third. More than half of the women saw their individual mercury levels drop by at least 25 percent. The reduction of mercury levels would likely continue for those who make a permanent switch to lower-mercury seafood. Although fetuses and children are most susceptible to its harmful effects, too much mercury can also harm an adult’s brain, kidneys and nervous system. At the end of three months, three study participants had higher levels of mercury than when the study started, and levels in one woman were essentially unchanged. These participants may have found it challenging to correctly identify and consistently choose low-mercury seafood. Emissions from coal-burning power plants are the largest source of mercury pollution. Rain washes it into the ocean, where it is consumed by fish and converted to highly toxic methylmercury which accumulates in fish tissue. It then accumulates in people who eat the fish. Mercury in the mother’s body can be passed to the developing fetus through the placenta, often reaching levels higher than in the mother’s blood. Exposure to mercury during pregnancy and childhood can cause lifelong deficits in learning, memory and reaction times. Because mercury builds up in hair, testing hair samples is a simple and effective way to measure mercury levels in the body. In 2016, EWG commissioned tests of mercury levels in the hair of 254 women who ate seafood at least twice per week. The hair of nearly three in 10 participants had more mercury than the Environmental Protection Agency’s guideline of 1 part per million, or ppm. The EPA’s guideline was set in 2001, but more recent research by independent scientists say a more protective level is 0.58 ppm. In our 2016 study, nearly 60 percent of the women had mercury levels exceeding that benchmark. Women with the highest mercury levels from the 2016 study were invited to participate in the dietary change study. All were provided guidance on the high-mercury fish to avoid. Our findings from the new study were similar to those in a 2017 Danish study of 146 pregnant women. These women opted for lower-mercury seafood options for three months without reducing the amount of seafood in their diets. At the end of the Danish study, participants had, on average, a 21 percent decrease in levels of mercury in their hair. A hair-mercury analysis is inexpensive, and it helps determining if one’s seafood intake is safe. We know that providing this information to the pregnant woman results in lowered mercury exposures to the fetus. That can potentially save substantial numbers of IQ points and thereby result in very large benefits for the cost. Individual changes in hair mercury levels differed for participants in the EWG and the Danish studies. The decrease in mercury in the body depends on a participant’s previous mercury levels, the overall composition of their diet, individual genetic and metabolic differences, and their consistency in following a low-mercury diet. In two other dietary studies, from Harvard Medical School in 2013 and the Wisconsin Department of Health Services last year, there was no change in hair mercury levels for women who were provided with information about mercury in seafood. This difference from the EWG results could be due to lower starting mercury levels or lack of adherence to the low-mercury diet. 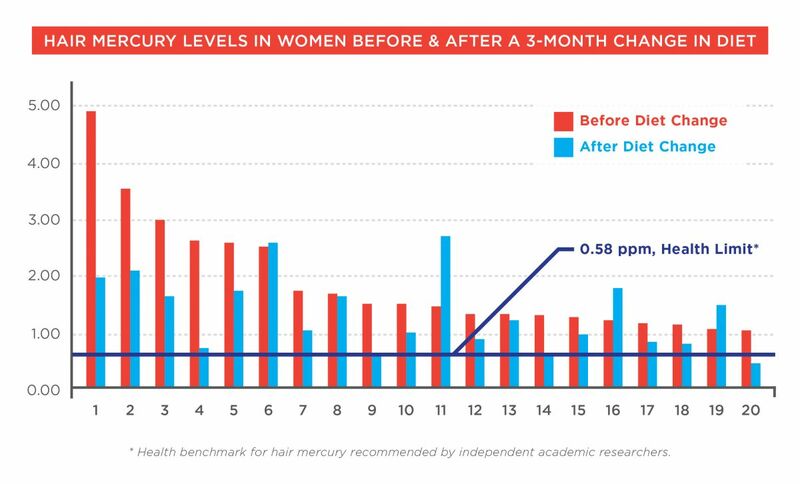 In those studies, initial levels of mercury in participants’ hair were about six times lower than the starting levels among EWG’s study participants. Nutritionists and prenatal health experts recommend avoiding mercury, but continuing to eat seafood to gain the nutritional benefits of omega-3 fatty acids that support brain development of fetuses and children. But the federal government’s Advice About Eating Fish promotes consumption of some fish species high in mercury, which can harm brain development in children, and fails to identify the best choices for seafood high in omega-3 fats. EWG’s Seafood Calculator addresses both concerns, focusing on seafood with lower mercury and higher omega-3 levels. This table summarizes the differences between the federal government’s seafood advice and EWG’s. Women and children should eat two to three servings of a variety fish and seafood each week. An adult serving is four ounces. For children ages 4 to 7, a serving is two ounces. Women of child-bearing age, children, and people with heart disease benefit the most from eating seafood. Aim for one or two meals of sustainable, low-mercury seafood each week. More than three meals a week may not be beneficial and increases exposure to other contaminants in seafood. Eating fish high in omega-3 fatty acids supports healthy brain development in babies and is also beneficial for heart health. But eating too much of the wrong kind of fish exposes you to too much mercury. Only seven fish that are highest in mercury are listed to avoid. 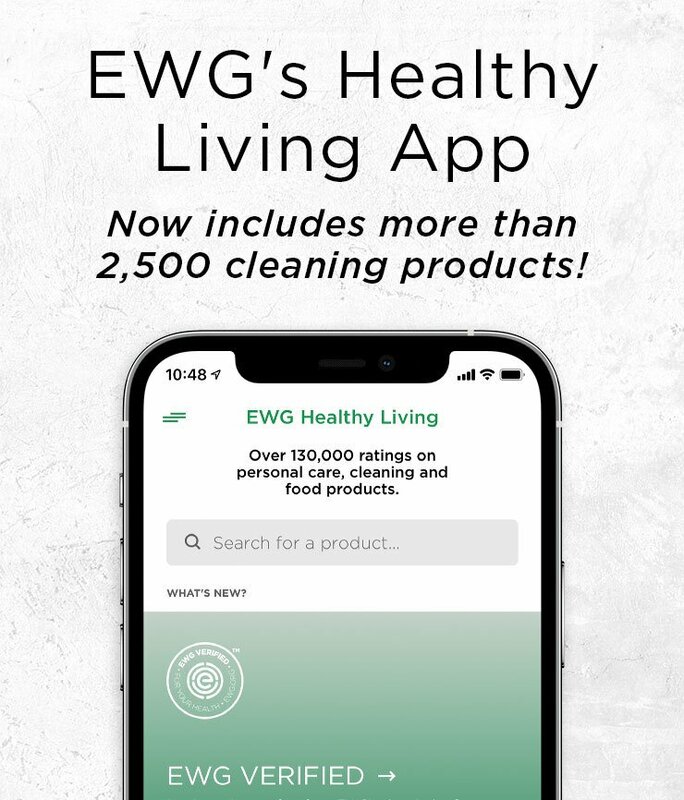 EWG’s Seafood Calculator gives details on many different species to avoid, directs you to better choices, and gives guidance on how many servings can be eaten a week. Eating two or three servings of some fish recommended by the EPA and FDA as best choices may result in too much mercury exposure, especially for children or smaller women. Advice does not specify species high in omega-3 fatty acids. EWG’s Seafood Calculator indicates species that are both low in mercury and high in omega-3 fatty acids. Omega-3 fatty acids are low in most popular fish and seafood. Most women of child-bearing age do not get enough omega-3s. No guidance on tuna sushi or tuna steaks known to be high in mercury. Tuna sushi and tuna steaks, usually yellowfin or bluefin tuna, contain significant amounts of mercury. Pregnant women and children should avoid. More than one-third of Americans’ exposure to mercury comes from tuna, because it is consumed frequently and is high in mercury. Canned light tuna is listed as a best choice and albacore tuna as a good choice if eaten once per week. EWG cautions pregnant women and children to limit canned light tuna to no more than one serving a week for children and for smaller or average-weight women. Pregnant women and children should avoid albacore tuna or eat no more than two servings a month. Canned light tuna is usually skipjack tuna, but can contain yellowfin. Pregnant women eating two servings per week of these types of tuna would ingest the amount of mercury that independent experts consider too high. One serving of albacore tuna for pregnant women per week would also result in unsafe mercury levels. Our 2016 study estimated that 60 percent of the women enrolled did not get enough omega-3 fatty acids. Eating fish rich in omega-3s can also reduce the risk of heart disease, decrease the risk of dying from a heart attack, relieve inflammation and help protect against cancer and autoimmune diseases. The best way to consume omega-3 fats is to eat fish, rather than taking supplements, which do not provide the same benefits. In the Harvard Medical School study, the body levels of an omega-3 called DHA increased by 30 to 50 percent for study participants provided with guidance about fish low in mercury and high in omega-3. In the past, the FDA has expressed concern that warning pregnant women about mercury in seafood would discourage them from eating enough fish. But as our new study showed, the overwhelming majority of participants were easily able to avoid high-mercury seafood. In addition to the well-established benefits of good seafood choices for heart health, a recent study from the Harvard School of Public Health found that couples who ate at seafood at least twice a week were more likely to get pregnant within a year compared to couples who ate seafood once a month. The study did not identify why seafood consumption correlated with greater chance of conception, but given that infertility affects up to 15 percent of couples in the U.S., it’s another reason for prospective parents to eat enough healthy fish. EWG recommends that people who enjoy eating seafood aim for one or two meals of sustainable, low-mercury fish each week. Pregnant women, children and people with heart disease should include species high in omega-3 fatty acids. More than three meals per week may not be beneficial and increases exposure to other contaminants in seafood. EWG’s Consumer Guide to Seafood, with additional information about choosing healthier fish for maximum health benefits, is available here. EWG’s hair mercury and dietary change studies were designed and carried out by Sonya Lunder, former EWG senior analyst. Want Our Guide to Safe Drinking Water? Donate $10 or more to help EWG expand its work protecting children’s health and get a free electronic copy of our Guide to Safe Drinking Water!